Do you love pets and are you looking for a small business opportunity in a rapidly growing industry? More and more people are willing to put their money where their hearts are, so starting a pet business can be very profitable. Americans spent $69.51 billion on their pets in 2017, up from $66.75 billion in 2016. This number has been rising steadily since 1994. In Canada, households spent $6.6 billion on pets in 2015, a figure that’s been rising steadily and is expected to reach $8.3 billion by 2018, according to the Pet Industry Joint Advisory Council of Canada - and 59% of Canadians say the bond they share with their pet is as strong as or stronger than the bonds they share with family and friends. Internationally, China is experiencing annual growth rates in pet ownership of more than 30% annually, making it the third-largest in terms of pets owned after the U.S. and Japan. So how might you get into the pet business? This article presents eighteen pet business ideas that might appeal to you. The ideas below range from pet-based products through providing pet services that involve working with animals, but you won't find any pet business ideas on the list that involve the retail breeding and selling of animals. Both the American and Canadian Societies for the Prevention of Cruelty to Animals are opposed to this practice. Pet sitting make the top of the list because a) there's an almost universal need for it and b) it's a very flexible business. For instance, if you live in a suitable place out of town, you can run a pet sitting business as a kennel operation with people bringing their pets to you and dropping them off. But that doesn't have to be the case; you can also go to people’s homes and look after their pets' needs. Or, you can combine a pet sitting business with a house sitting business and look after people's homes as well when they're away. Retired people in particular tend to travel regularly, making pet/house sitting a popular business for catering to seniors. Another pet business idea on the same theme, the Doggie Daycare has very similar pros and cons. There is an increasing need for this kind of pet service as more working people are discovering that dogs left alone day after day while the owner works can bark and be destructive. On the con side, though, you may find this a difficult business to locate because of zoning regulations and municipal by-laws. If you can do this and do it well, you can probably write your own ticket. There are an awful lot of people out there who don't have enough time or skill or both to train a dog properly - but for some reason, have bought one anyway and now need someone to train it. The venue is not necessarily a problem; facilities to run dog training classes can be rented. Learn more about How to Start a Dog Training Business. If you're a really skilled animal trainer and have an interest in media, maybe a pet business specializing in training animals for film and TV is for you. Remember Morris the cat? Lobo? Moose, the Jack Russell terrier on the TV show Frasier? Some animals become huge stars. Hollywood Paws (based in Los Angeles) is an example of a business that trains animals and their owners to work in the entertainment industry. Are you the kind of person who enjoys solving puzzles? Maybe you've even thought of being a detective at some point. If so, you might put your sleuthing skills to work running a Pet Finding business. You can help distraught pet owners get their loved ones back and make money too. Tracker dogs join growing the industry to help owners find lost pets (Steve Hendrix, Washington Post) profiles one such business, Pure Gold Pet Trackers, that uses the tracking skills of a golden retriever named Sasha to find people's lost pets. Another dog-related service that busy pet owners need is to have their dogs walked regularly. The key to success with this pet business idea is time management. You'd definitely want to have enough clients so you could take x number of dogs out for a walk at a time, rather than just walking one and then returning it to its owner. Read 11 Time Management Tips. Dog grooming is a very popular pet business as grooming is one of those chores related to dog ownership that many people would rather pay someone else to do rather than do themselves. Another reason for its popularity is that, like pet sitting, it's quite a flexible business idea. 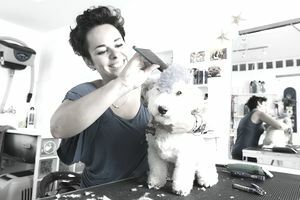 You could operate a dog grooming business as a mobile service or run it out of a retail shop, for example. While we're on the subject of chores related to dog ownership that many people would rather pay someone else to do rather than do themselves, don't forget poop scooping. This involves visiting customers' properties on a weekly or monthly basis and collecting and disposing of dog feces. Yes, it's dirty, messy work but so are lots of things that people do to make money. On the pro side, there's no special training or equipment needed and you can easily operate this business from home. Having bathed dogs before, I can definitely see why some people don't want to do this in their own homes; wet and messy only begins to describe it. A dog bathing business could be operated as a standalone business or as an adjunct to a pet grooming business. Or you could run this as a do-it-yourself business, where all you provide is the facilities and the equipment. So far I've written about pet services related to pets' basic needs. But there's a whole growing sector of pet businesses related to pets' not-so-basic needs, as pet owners look for more ways to help their pets lead longer and healthier lives. Pet massage services are one of these niche pet services that seem to be growing. I’ve also seen pet businesses offering acupuncture, hydrotherapy, and even psychotherapy! In many of these fields, there is specific pet-related training required to become a practitioner. And speaking of upscale pet services, what about restaurants devoted to dogs? No, not just restaurants that allow you to bring dogs with you, but restaurants where the dogs are the diners. See this collection of Dog Restaurants Where Humans Are Welcome, for instance. Is this a pet business that would be allowed where you are? You'd definitely need to check both health regulations and municipal by-laws before you did anything else. Just as with the food they put into their own bodies, pet owners have become increasingly concerned about the quality of the food their pets eat and are continually on the lookout for pet foods that they feel have additional health benefits. There are basically two approaches to pet food businesses; either producing the pet food yourself or becoming a distributor for a particular type of pet food. Dog bakeries, homemade healthy dog treats, raw foods, gourmet foods – any of these could be extremely lucrative if the pets (and the owners) like what's on offer. Pets, children – the difference between them has blurred considerably in the eyes of many pet owners. So many dog owners like to dress up their pets, creating all kinds of pet business opportunities to supply dogs with fashionable, good looking gear. (Cat owners know that they'll be lucky to get away with putting a collar on little Tiger, let alone anything else, so the opportunities for creating and selling cat gear are much more limited.) Once again, you can create the couture yourself or distribute someone else's. The key to success for many small businesses is to find and fill a niche market. Pet business marketing is an example of this. There are so many pet businesses now that it's possible to run a successful marketing business that caters to the needs of pet business owners exclusively. FWV Fetching, for instance, provides everything from blogging placement and social media through trade show campaigns exclusively for pet businesses since 2003. If you have the marketing expertise, pet marketing might be the business you’ve been looking for. And if you have artistic talent and love animals, you might start a pet business painting portraits of people's pets. Along these same lines, you might start a pet photography business if that's where your talents lie. You'll probably need a lot of patience during the sittings needed when you're working to portray an animal, too. Be that as it may, as people give their pets more and more importance in their lives, they seem to have an increasing need to commemorate them. Being a veterinarian is the original pet business. And nowadays, veterinarians are able to make good livings specializing in treating pets such as dogs and cats. The downside is that this is a business that requires years of training and, like being a human doctor, has strict accreditation and licensing requirements. How to Become a Veterinarian explains the details. Is a Pet Business the Right Business for You? To run a successful pet business, you have to love and be knowledgeable about the animals you're going to be working with, and in some cases, as you see from the descriptions of the businesses above, that involves years of specialized training. But you also have to bear in mind that even that isn't enough. A pet business is just like any other small business; the key to success is choosing the right business for the right time and place. You may be a wonderful dog groomer, but if you live in a small town and there are already three dog grooming businesses operating there, you're going to have a tough time of it. What Type of Business Should You Start? provides an easy-to-use guide to figuring out what kind of business is best for you. And before you start a pet business, do the research and work through a business plan, just as you would for any other new business venture. The Business Plan Outline will lead you through the process.